A few weeks ago we took a look at the trends in U.S. wheat and observed that wheat acres had been steadily declining since the 1980s. This got us (and many readers) to wondering about the trends in global production. This week’s post takes a look at global wheat trends by digging into acres harvested, production, and how the U.S. fits in. World wheat acres harvested is shown in figure 1. Overall, acres trended higher from the early 1960s until 1980 when a peak of nearly 590 million acres occurred. Since the early 1980s, the area of wheat harvested settled slightly lower. For the 2016/2017 market year, harvested wheat acres were 544 million, which is the same as the 56 year average. While the graph in figure two shows some changes in wheat acres, it is important to note of the scale on the axis which highlights rather small changes. 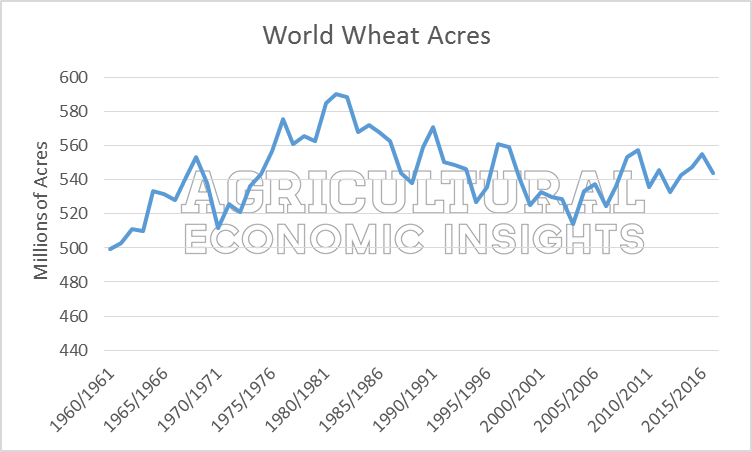 In general, world wheat acres are actually quite stable. As mentioned, the 56 year average is 544 million acres. Given this reference point, all of the historic data falls within plus or minus 10% of the average (598 million acres to 489 million acres). This is a pretty tight range given the scope – global acres – and time frame – 56 years. So in general, what one observes with wheat acres is that they have been relatively stable all the way back to the 1960’s. Given that the world has increased the harvested area of primary crops by 40% since the 1960’s, most of the new acres have not gone to wheat. Figure 1. Harvested World Wheat Acres, Millions of Acres. 1960/1961-2016/2017. Data Source: USDA FAS. A second way to measure the size of the world wheat crop is by production, or in millions of metric tonnes harvested (figure 2). 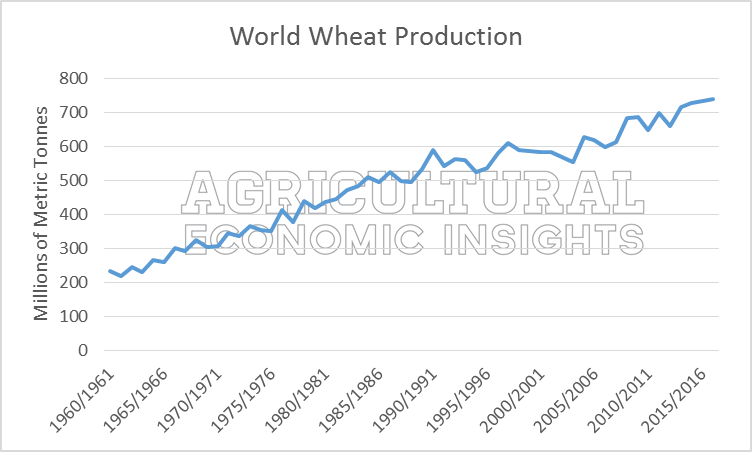 Over the past 56 years, world production of wheat has steadily trended higher. The rate of increase is equal to an annualized rate of 2.1%. While this is a slow rate for something like a savings account, the “Rule of 72” suggests that world wheat production doubles every 35 years. Given that acres have stayed relatively stable (figure 1) as wheat production has increased (figure 2), this suggests that wheat yields have been the primary driver of increased wheat production. For the 1960/1961 market years, global wheat yields were an average of 1.15 metric tonnes per hectare. Most recently (2016/2017) the world wheat yield is an estimated 3.36 metric tonnes per hectare. Figure 2. World Wheat Production, Millions of Metric Tonnes. 1960/1961-2016/2017. Data Source: USDA FAS. 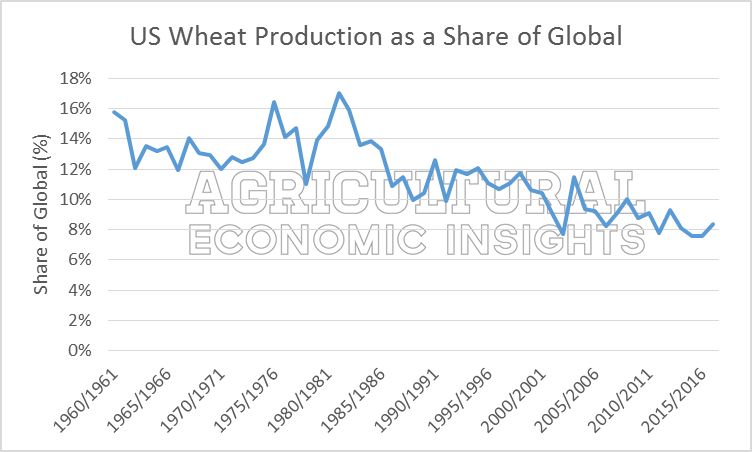 Given the earlier noted trend of fewer U.S. wheat acres since the 1980s and overall flat harvested world acres, it’s no surprise that the U.S. accounts for a smaller share of global wheat production (figure 3). The U.S. routinely represented 12%-14% of global production up until the mid-1980s (read more about U.S. acreage reductions in the 1980s here). During the 1990s and early 2000s, U.S. wheat production as a share of global output shrank to around 10% to 12%. Since 2008 the U.S. has produced less than 10% of total global wheat output. Figure 3. US Wheat Production as a Share of Global Wheat Production. 1960/1961-2016/2017. Data Source: USDA FAS. While the trend of fewer U.S. wheat acres plays out in several ways, possibly the most evident way is the shrinking role of U.S. wheat exports (figure 4). The U.S. represented 40% to 50% of total wheat exports for several years during the 1970s. Most recently, U.S. wheat exports were 12% to 15% of total exports. To frame these data a little differently, for every 10 bushel of wheat a foreign nation purchased in the 1970s, on average, 4 to 5 bushels were grown in the U.S. Today, fewer than 1.5 out of every 10 bushels purchased are U.S. exports. Figure 4. 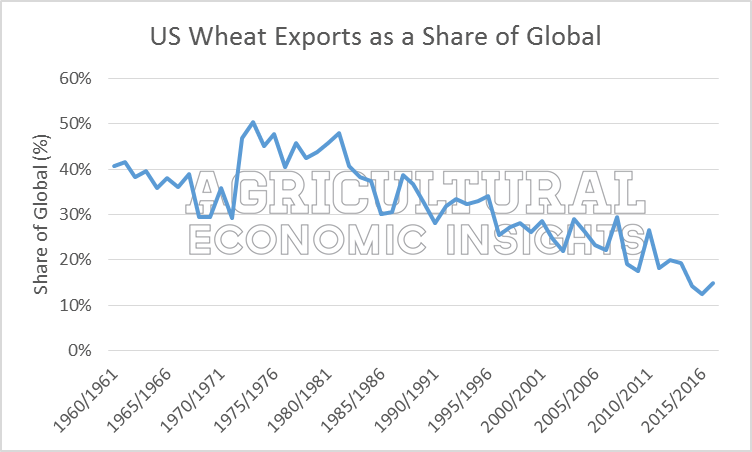 US Wheat Exports as a Share of Global Wheat Production. 1960/1961-2016/2017. Data Source: USDA FAS. Since the 1960s, global wheat acreage has stayed relatively stable (figure 1) as production, driven by advances in yields, has trended higher (figure 2). Coupled with shrinking U.S. wheat acres, the U.S. today accounts for less of the world’s wheat production (figure 3) and total exports (figure 4). In spite of this, the wheat market has managed to run ahead of demand and has come upon a period of low prices. Further, wheat acres have expanded more slowly than acres of other crops, yet farmers around the world have apparently managed to grow enough wheat to pressure prices lower. This post is part of our “wheat’s woes” analysis as we take a close look at the conditions and trends in wheat production, especially in light of extremely tough economic conditions. We’ll dig further into these data, and more, in upcoming posts. Stay tuned.